This is a preview of a non-final prototype. 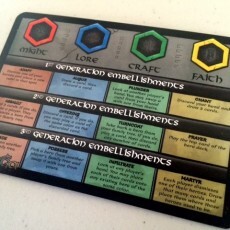 Components, art, and the rules described in this preview may change between now and the final, published game. You are the stuff of legends. Your lineage is one of greatness from generation to generation. The tales of your triumphs are to be shared across the land, lest anyone doubt your excellence. Build your family tree and share your saga for all to bask in your glory! 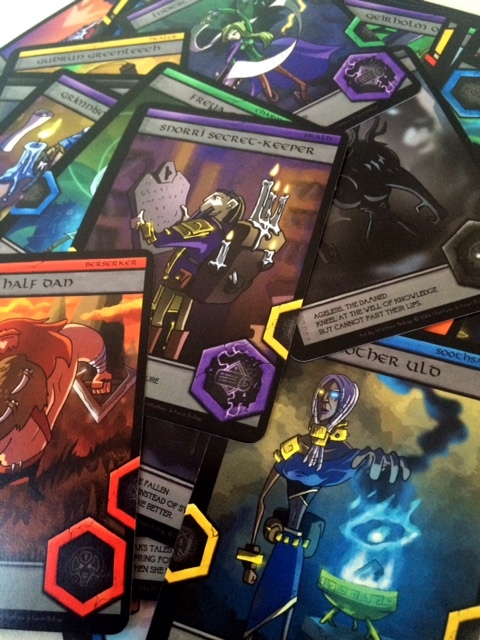 Norsaga is a hand management card game for 2-4 players from new designer Kevin Bishop, with super neat art from his brother, Matthew Bishop. In Norsaga, you build your family tree with hero cards so as to include all of the traits that build your saga, creating an epic tale of heroism and magnificence. 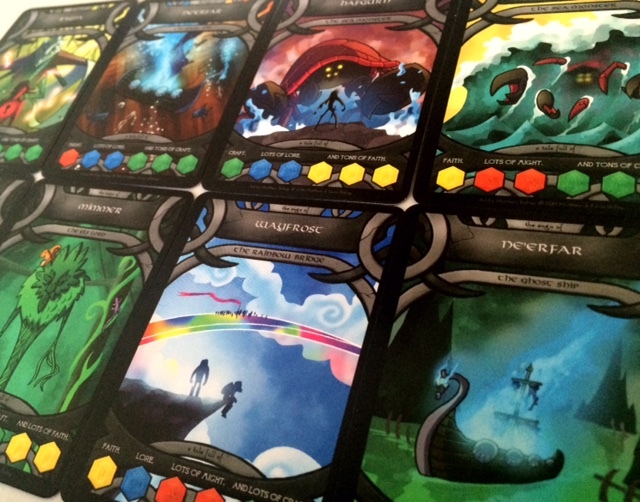 To start the game, you receive a saga card – the objective card that details the story you are to tell. 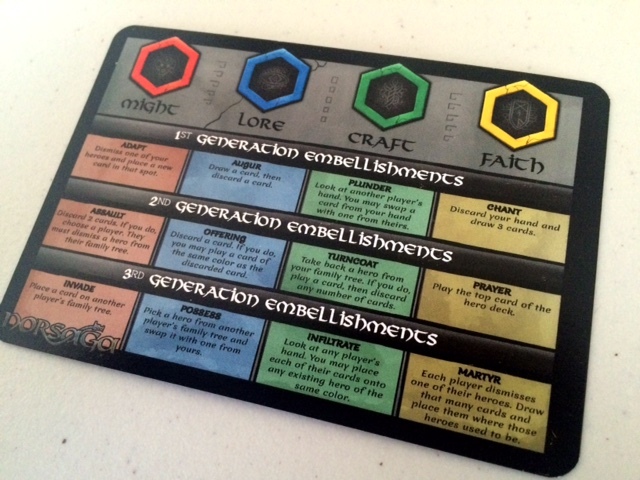 Saga cards have a set of heroic traits, for which you receive the corresponding inheritance markers. It is your goal to detail your family tree and place all of the inheritance markers associated with your saga. Draw until you have four cards. Use an embellishment (if you’re eligible for it based on your current family tree). Play a hero card onto your family tree. Playing a hero card allows you to place an inheritance marker of the associated type from your saga card on one of its traits (either the dominant trait or a completed recessive trait). 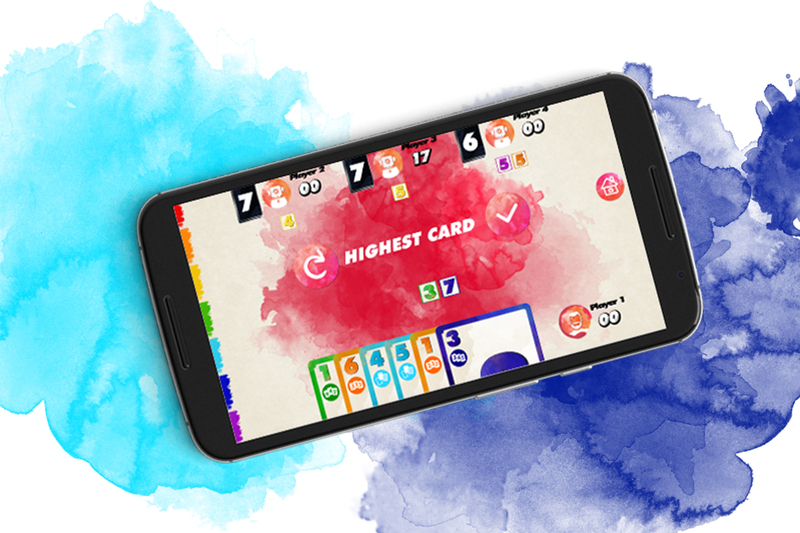 Hero cards can be played anywhere within the three levels of your family tree. Define yourself (generation 1) or start your tale with your grandparents; it’s up to you. In addition to allowing you to place inheritance markers, dominant traits allow you to use embellishments. Embellishments are special abilities that allow you to modify your hand, play extra heroes, or even play heroes onto other players’ family trees. For each generation of a particular trait your lineage carries, the stronger your embellishments of that type will be. You continue to take turns in this manner until someone has placed all of their inheritance markers, at which point you have completed your saga and won the game! 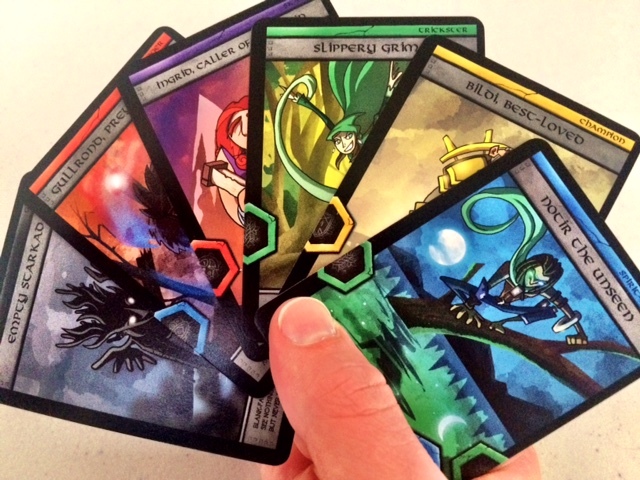 Norsaga is a light, 30-minute card game with a nice puzzle feel to it. It’s quick to learn and easy to play, while still requiring a little bit of strategy. Because you need to play certain colored cards to be able to place your inheritance marker tokens, you need to ensure you’re matching the right colors and rearranging your family tree based on the tokens you still have to play. Norsaga requires you to be both flexible and purposeful in your card choices as there is always the chance you won’t get the card you need for that one, final inheritance marker. 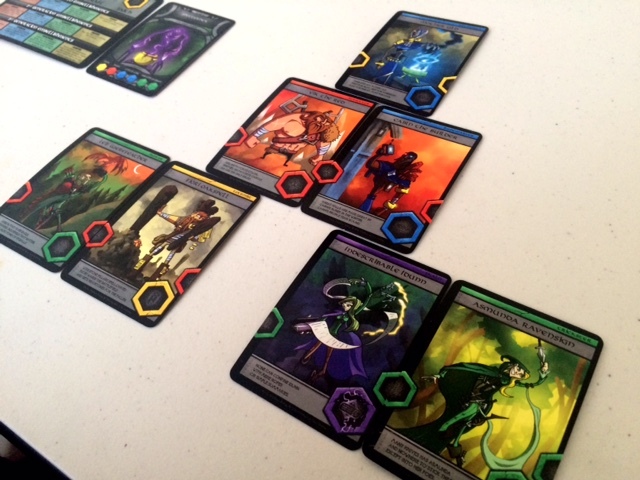 Further, when you think you’ve got the game down, Mr. Bishop has created advanced cards that increase interaction across the table and pit you against the puzzle and your opponents at the same time! Ghosts haunt spaces in your family tree, giving you the option for a powerful embellishment at the risk of painting a target on your back for a turn. Skalds prove relatively worthless for placing inheritance marker, but can open up the chance for using multiple embellishments in a single turn. The added elements are welcome and became auto-includes once we were past our first few plays. Combining hand management, a bit of “take that,” and some puzzle elements, Norsaga is a filler game unlike other games on the shelf. Building your family tree is enjoyable and planning several moves ahead becomes an obvious necessity as you attempt to navigate the race to tell your tale and place your inheritance markers. Being a simple card game, rounds can feel a bit scripted as your moves largely depend on your card draw during that particular turn. That being said, a quick play time and the unique embellishment system work in Norsaga’s favor, as the game stays light and quick. 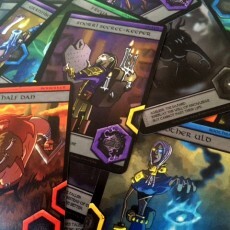 The use of skalds and ghosts is a necessity to help facilitate a more interactive and interesting puzzle, although the base deck of hero cards still presents a fun – though largely solitary – challenge. My favorite part of Norsaga is without-a-doubt the art and flavor text, which combine a really pleasing comic style with light-hearted and often witty flavor text. So, while I find the gameplay moderately enjoyable from a strictly mechanic perspective, it’s the storytelling that elevates the game and makes me want to get it back to the table. In a game about telling epic stories, I’d count that as a win. Getting into the story of a game is something that I enjoy, and Norsaga wins by letting me dust off my best skaldic voice and proclaim my family lineage and the mighty deeds they undertook! As for the gameplay itself, there is a puzzle element in determining which of the heroes you should pair up, keeping in mind that you can only score one of the dominant traits from each couple. Given the number of traits that must be matched versus those available, the recessive traits are essential to completing your saga. The embellishments (special powers) that become available seem very powerful, with a Lore-speaker at the head of a family easily able to take a commanding lead unless kept in check by a Mighty warrior. 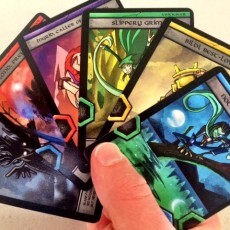 Many powers force you to discard cards from your hand as part of the cost, but given that you automatically refill your hand to four cards every round, there is very little reason not to use them at every opportunity. The League of Nonsensical Gamers would like to thank Meromorph Games for kindly providing us with a prototype of Norsaga for this preview. Norsaga is currently funding over on Kickstarter. If this game piques your interests, head on over to the campaign page by April 28, 2015 to purchase your own copy. For $20 (plus shipping), you will receive a copy of the game along with all of the stretch goals that have been attained.